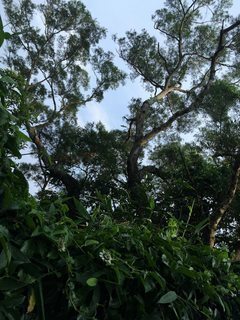 I saw this large bird gliding fairly low over the trees while hiking in the late afternoon in some hills near Taipei recently. It seemed quite large compared to what I normally see here. 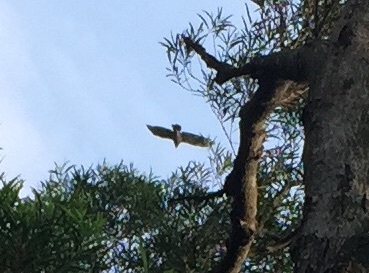 It's quite difficult to gauge, but I'd guess the wing span was one meter or so. It made that shrill, descending, single "peeeew" sound that I associate with birds of prey (probably mostly from old movies or TV commercials). 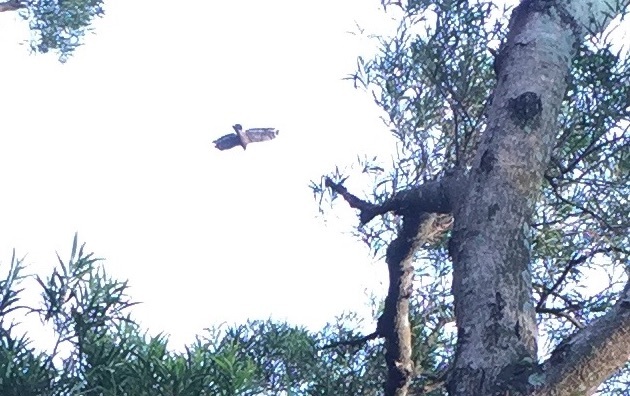 Is it at all possible to guess if this is a hawk or an eagle from these cell phone snapshots? These are cropped out of the full resolution originals. A half-size original for scale is also included. The words "hawk" and "eagle" are very confusing and may mean different things in different parts of the world. In fact, the nearly thirty species of raptors (not including owls) native to Taipei apparently include one called a mountain hawk-eagle (Nisaetus nipalensis). If no one can answer your question, you might narrow the field with a process of elimination. I can't vouch for the accuracy of Wikipedia's list of birds native to Taipei, but it's a start. There are apparently seven native raptors that are called eagles. If you can eliminate all seven eagles, then it presumably is not an eagle. Your photographs are helpful insofar as they illustrate the bird's general outline, but it's very hard to distinguish its color pattern. However, the shape of the wings should help narrow the field. I don't know if you're familiar with the terminology, but many raptors are classified as buteos or accipiters. If I remember correctly, species with broader wings are generally buteos. Species commonly called "hawks" include both buteos and accipiters, but I believe most birds called "eagles" are buteos. What animal / bird is this?